Nevada Legislature Approves Bill Outlawing Urine Testing of Suspected Pot-Impaired Drivers . Lawmakers last Thursday gave final approval to Assembly Bill 135 , which would bar the use of urine tests for driving under the influence of marijuana because the science shows that urinalysis does not actually measure impairment -- merely the presence of marijuana metabolites. Under the bill, drivers suspected of being under the influence of pot would be subjected to a blood test, which actually measures THC levels (although not impairment). The bill does not change the state's per se DUID level of two nanogram of THC per milliliter, which presumes drivers are impaired at that level. New Jersey Legalization Bill Rolled Out Today . State Sen. Nicholas Scutari (D-Linden) on Monday introduced a legalization bill, even though he conceded it was unlikely to become law while Gov. Chris Christie (R) is still around. Christie's term ends in January. The bill would allow the possession of up to an ounce, 16 ounces of edibles, and 72 ounces of marijuana-infused beverages, but would not allow personal cultivation. The bill would also create a Division of Marijuana Enforcement to regulate marijuana commerce, with a sales tax of 7%, rising to 25% over five years. The bill is not yet available on the legislative website. Iowa Governor Signs CBD Cannabis Oil Expansion Bill . Gov. Terry Branstad (R) last Friday signed into law House File 524 , which expands an existing law that allows people with certain conditions to use CBD cannabis oil, but did not allow for production or sale of the oil. The new law lets the state authorize up to two facilities to grow marijuana and produce cannabis oil to be sold in five state-approved dispensaries. It also expands the list of qualifying illnesses to include 15 chronic conditions. Seattle Supervised Injection Sites Face NIMBY Opposition . Opponents of proposed supervised injection sites -- one in Seattle and one possibly in suburban King County -- have organized a local initiative campaign to put the proposal to a county-wide vote. Initiative 27 needs some 47,000 valid voter signatures by July 31 to put the proposal to an up or down vote on the November 2017 ballot. 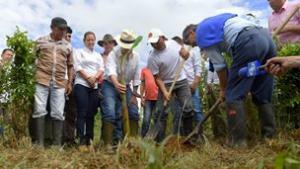 Colombian Government Begins Coca Eradication, Narcos Begin Fight-Back . President Juan Manuel Santos took part last Thursday in the kickoff of a campaign to eradicate coca crops and provide substitutes. The government wants to eradicate some 125,000 acres of coca -- more than three times the amount eradicated last year -- but with the FARC now demobilized, drug traffickers and militias are now waging a campaign of threats, intimidation, and violent attacks to protect their business, leaving coca growers caught between the government and the narcos. Nearly three dozen rural community leaders have been assassinated since the November peace deal, and the traffickers seems to be tailing government officials trying to sell the program. In one Putomayo town last week, anonymous pamphlets threatening cooperative leaders appeared the next day. Mexican Cartel Fight Over Reynosa "Plaza" Leaves More Than Two Dozen Dead . As of late last week, at least 28 people had been killed in fighting among drug traffickers over who would control "la plaza" (the franchise) in the Mexican border town of Reynosa. The dead include cartel members, civilians, and members of the military. The combatants are variously described as either members of the Zetas and Gulf cartels or factions of the Zetas. British Lib Dems Embrace Marijuana Legalization . The Liberal Democrats have adopted a platform that includes legalizing marijuana and marijuana commerce. The Lib Dems were the third force in British politics behind Labor and the Conservatives, but saw their number of MPs drop dramatically in the most recent elections after joining the Tories as a junior partner in a coalition government. The Lib Dems are now the fourth force in British politics, having been surpassed by the Scottish Nationalists in the last election.